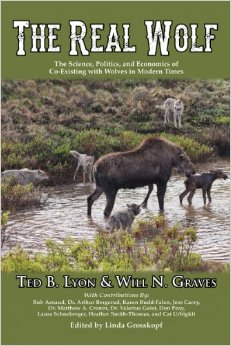 This is about a 12-minute radio interview with Ted Lyon, co-author of the book, The Real Wolf: The Science, Politics and Economics of Co-Existing With Wolves in Modern Times. Visit The Real Wolf website. *Editor’s Note* – The below article appears in the Outdoorsman, Bulletin Number 54, Oct.-Dec. 2013. It is republished here with express permission from the author. Please honor the protection of intellectual property and copyright. The Outdoorsman is the leading publication of truth concerning outdoor issues. To the right on this webpage is a link to follow in which readers are encouraged to subscribe to the print publication. Money is necessary for the continued publication of this important work. Thank you. 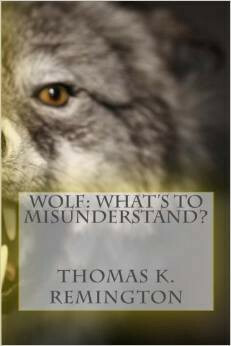 When Will Graves asked me if I would consider writing a chapter for The Real Wolf, which he co-authored along with Ted Lyon, my first reaction was that it would be a wonderful opportunity to provide factual information to countless people who have been bombarded with fairy tales about living with wolves. 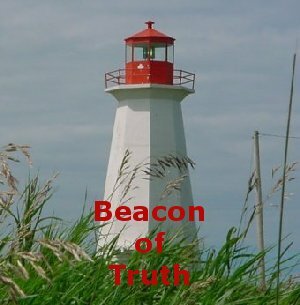 But after learning the names of several bona fide experts from various fields who, like Graves, had already agreed to provide their facts, I felt that anything I added to the book would be coming from a researcher rather than an expert. In late November of 2013, Ted Lyon sent me a manuscript of The Real Wolf and asked me to write a review in The Outdoorsman. When I took the time to read the manuscript thoroughly, I was amazed by the straightforward collection of facts presented without anger, apology or attempts at political correctness. I agree with comments by Tom Remington in his “Foreword” that The Real Wolf is loaded with resources from several of the most renowned scientists, researchers, investigators, and historians the world has to offer. I also share Tom’s confidence that this book is destined to become the encyclopedia of wolf facts for readers who have never had the opportunity to read the whole truth. After briefly sharing his outstanding 37-year career as an attorney representing clients in more then 150 jury trials, Lyon said he always relied on the truth. Then he confided that he did not fully believe the horror stories he kept hearing about wolves until after he bought a second home in Montana and experienced that reality himself. His background as an avid hunter, including a period long ago as an outfitter and guide, probably influenced the amount of time he spent researching and verifying the information he has collected. The fact that he reported FWS biologists providing false information about wolves, and later, state biologists in Idaho and Montana lying to support what FWS said, reflects his intent to report all of the facts. The Real Wolf also includes documentation by experts other than scientists of frequent radical changes in what was considered the legitimate wolf species to be protected. For example, Jim and Cat Urbigkit documented the existence of the original Northern Rocky Mountain Wolf, Canus lupus irremotus, on their sheep range in Wyoming before the larger Canadian wolves were introduced. Cat Urbigkit reminds us that they presented their information through the courts, and Federal Judge William Downes finally ruled that introduction of Canadian wolves was illegal. He also ordered immediate removal of all Canadian wolves that had been introduced two years earlier, along with their offspring. But several days later he put a stay on the removal order until it was appealed. And several months later the new court held that FWS had authority to change the subspecies that was being preserved, and the charade continued. Chapters by Arizona’s Laura Schneberger and Catron County New Mexico Wildlife Investigator Jess Carey are vital to explain why wolves that are crossbred with dogs and raised in captivity represent a special threat to livestock and humans. The calculated non-reimbursed losses for livestock in both locations should end efforts to continue the wolf transplants – but they haven’t. “There have been few issues during my 40 years in public life that have provoked the raw passions of so many people from around the world as the debate over wolves. I was deluged with some of the nastiest, most disparaging, and truly hateful letters, emails and phone calls from well-meaning but badly misinformed folks, who saw wolves only as big beautiful dogs harmlessly pursuing their majestic lives in the trackless wild. Wolves are an essential and misunderstood part of the Rocky Mountain ecosystem, many argued, and we owe it to our Western heritage to enable wolves to once again roam freely in the Idaho wilderness. “The problem is that wolves don’t stay put. Their enormous range, high reproductive rate and insatiable hunger for ungulates inevitably draw them out of the woods to interface with man. As their numbers spiraled far beyond expectations, so did the conflicts, and so did my determination to manage wolves as we do any other species – with an eye toward the bigger picture of a balanced ecosystem that includes man. a sympathetic judge, collected millions of taxpayer dollars to pay their lawyers, and looked for any opportunity to abandon their commitment to pay for our ranchers’ losses to wolves released in Idaho. “Ted, and many others who recognize that reality, fought tough odds to turn the tide on the wolf issue. Now Idaho, Montana, and Wyoming are managing wolves – wolves that never should have been here in the first place. But since they are, the happy ending to this story is that the people most affected by their presence now are managing them in a way that’s far more balanced and reflective of the realities of today’s West. They will never be “our wolves,” but at least now we have a primary role in controlling their population and impacts. A donation in any amount will help defray our cost of printing and mailing The Outdoorsman to several hundred state and federal elected or appointed officials. 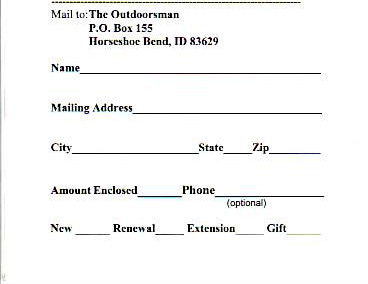 A donation of $25 or more will pay our cost of printing and mailing the next six Outdoorsman issues to you. other species. I’ve been very close to this for a lot of years and I know of no place in the world that has ever been able to manage wolves as our wildlife managers do with other species. When the ratio of wolves to elk – their primary prey species in Idaho – got higher than it is in any other place in North America, we needed to lethally remove at least 75%-80% of the wolves in those high density areas. Maintaining very few, if any, wolves for five years until recovery occurred was essential. But now that our primary elk populations are in a predator pit from which they cannot recover, and wolves soon find them and drive them down each time they produce a few calves, we must initiate really aggressive control until elk numbers have reached the desired goal in each depleted area. I am pleased that Gov. Otter has taken this step which will allow recovery IF he selects the proper individuals with the sole motive to lethally remove wolves with all of the tools at their disposal until our elk and deer populations have recovered. No matter what state you live in, I urge you to visit http://www.farcountrypress.com/details.php?id=575 – then read about The Real Wolf and order at least one copy. The price is $21 for the Soft Cover or $30 for the Hard Cover and I know of no book of this quality for sale anywhere near this low price. Once you have had the opportunity to read it, I urge you to get a copy into the hands of your resource committee members, or at the very least, to the state legislators who represent you. How have thriving elk populations of thousands dwindled to mere hundreds in just a matter of years? Author Ted B. Lyon asserts the wolf is at fault. He also blames the wolf for the rampant spread of infectious diseases among livestock populations and the decimation of wild deer, moose, sheep, and domestic animals alike. A trial lawyer with over 37 years of litigation experience, Lyon proves his case in The Real Wolf: The Science, Politics, and Economics of Co-Existing with Wolves in Modern Times. In this detailed yet easy-to-read essay collection, authors Ted B. Lyon and Will N. Graves investigate the majesty and myths surrounding wolves in the United States and offer a new, true picture of the wolf in contemporary America. The Real Wolf is an in-depth study of the impact wolves as a federally protected species have had on big game and livestock populations. Each chapter in the book is meticulously researched and written by authors and scientists who have spent years studying wolves and wolf behavior. Contributing authors Rob Arnaud, Dr. Arthur Bergerud, Karen Budd-Falen, Jess Carey, Dr. Matthew A. Cronin, Dr. Valerius Geist, Don Peay, Laura Schneberger, Heather Smith-Thomas, and Cat Urbigkit each describe a unique aspect of the wolf in the United States. The Real Wolf does not call for the eradication of wolves from the United States, but rather advocates a new system of species management that would allow wolves, game animals, and farmers to live in harmony. It has been nearly 30 years since United States Government employees undertook steps to import Canadian wolves into Yellowstone and Central Idaho; much of that event done illegally. To pull it off, the greatest sales pitch, or con job, in U.S. History had to take place. Wolves were sold as something they were not. Wolf advocates deliberately lied[this has been changed to something more politically correct], brainwashing masses of people with images of the gray wolf as a “keystone predator”, an “indicator species”, a “flagship species”, and all wrapped up in descriptions of wolves “balancing nature” and “sanitarians” of the forests. This was all done for one purpose: to sell the people about introducing wolves into the Lower 48 States. After all, if people were reminded of the truthful history of wolves globally, they would not have fallen for the idea. It has taken nearly 30 years to compile between two book covers all the facts to explain to the American people that they were lied[also changed] to about the wolf. Everything you need to learn about the truth concerning wolves, can be found in “The Real Wolf.” The Real Wolf is destined to become the encyclopedia of wolf facts, loaded with resources from some of the most renowned scientists, researchers, investigators and historians the world has to offer. The Real Wolf presents hundreds of pages of documents, facts and real life stories about gray wolves, including over 450 references, footnotes and links to sources and facts. What began in this country at least 100 years ago, a deliberate effort to change the minds of American children, cannot be reversed in one book publication, but as far as the repulsive fairy tales that have been told about gray wolves around the world, The Real Wolf is a strong first step. It should be the foundation of understanding the wolf and required reading for all wildlife managers and biologists. For those always wishing they had at their disposal a comprehensive publication in which to share with others and increase their own knowledge of “real wolves”, The Real Wolf is certainly something to add to your library. Some of my favorite researchers and scientists have contributed to this book: Will N. Graves, author of Wolves in Russia: Anxiety Through the Ages; Dr. Valerius Geist, a leading ethologist and professor emeritus University of Calgary; Dr. Tom Bergerud, the world’s leading authority on caribou; and Dr. Matthew Cronin, a research professor of Animal Genetics at the University of Alaska in Fairbanks. The Real Wolf will teach readers of wolf history across the globe, wolf introduction in the United States, the more than 50 diseases wolves carry, how U.S. Fish and Wildlife Service alters science to fit agendas, how mongrel mutts are being introduced as pure wolves, the devastation wolves have had on other wild animals and private property depredating livestock and the unbelievable affect it has had on people, plus a whole lot more.